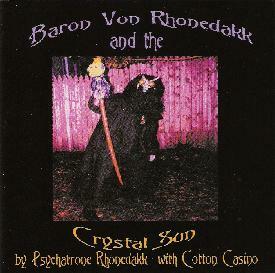 Psychatrone Rhonedakk with Cotton Casino - "Baron Von Rhonedakk and the Crystal Sun"
Following up from Keep On Psychedelic Mind, the ever-eccentric Psychotrone Rhonedakk returns with his latest offering, Baron Von Rhonedakk and the Crystal Sun. This time, Rhonedakk forgoes the more pulsating, rhythmic excursions of his previous album for a spacier, weirder, and even trippier sound than before. Things kick off with a very strange cover of Pink Floyd's Set the Controls for the Heart of the Sun. I’ve got nothing against cover versions, but I hate it when a band or artist does a virtual facsimile of the original version. What’s the point? Safe to say that Rhonedakk gives the Floyd classic his own unique twist, ably assisted by Cotton Casino of Acid Mothers Temple adding synth and voice to the mix. Cotton joins Rhonedakk on the second and third tracks as well, the first of those a swirling, ambient space whispery meditation called Several Species of Alien Beings Gathered In Space Jamming With Cotton. Sweet Lilac Angel, follows. Inspired by Neu!, it’s a tabla tapping, tripped out dronefest. From there on out, the album is pure Psychotrone Rhonedakk as only the man, the musician, and the mystery himself can do it. While Cotton adds a definite element of spaced-out freakiness to the tracks she plays on, the rest of the album is still a space fest, just not quite as deep space perhaps, with a little more down to earth, trancey kind of vibe to it all. In fact, things continue to hover on the outer edges of music with a 10-minute expedition into weirdness called The Dream, with mysterious, moaning voices and electric guitar that goes from something soft and jangly to groaning, soaring space sludge. Next up is another cover tune, this time of Nazareth’s Night Woman, originally from that band’s album Razamanaz. But this is a far cry from the original bluesy rocker, with it’s trancey hand drums, throbbing didgeridoo like drones, screeching guitars and Psychotrone’s strangely mellow and soulful vocals! Definitely one of the highlights of the album. Departure is the only track on this album reminiscent of some of the more upbeat numbers on “Keep On Psychedelic Mind”, pulsing along to an electronic rhythm while the melody crunches, slips, and slides all over the place. Things come full circle with a reprise of Set the Controls for the Heart of the Sun. This time it’s the ’Trone Alone Mix, which, as that name implies, is a version without Ms. Casino. It’s a minimalist, stripped down version, featuring only guitar and voice and makes for a nice end to the album. If you like your psychedelic music particularly peculiar and spacey, this is the album for you. Psychotrone Rhonedakk has produced yet another tripped out tour de force to please all of us freaks and space cadets out there.